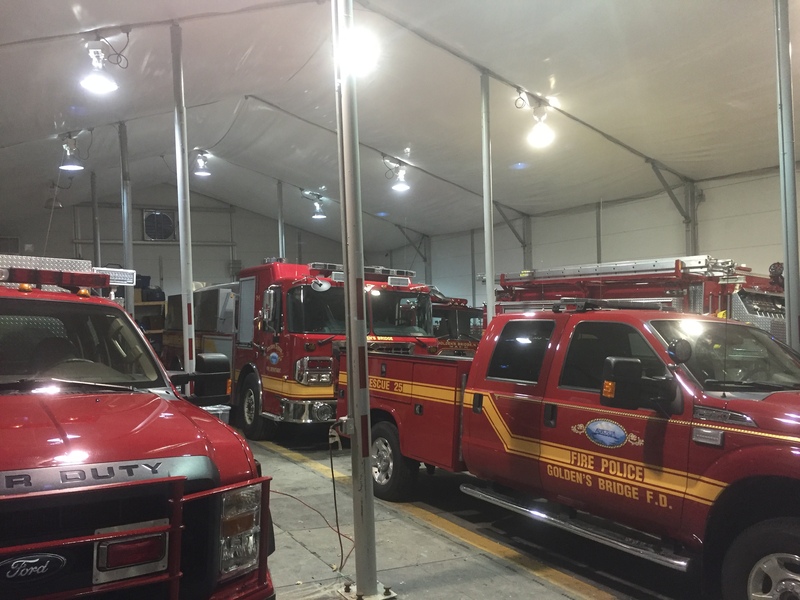 In February 2014, Mahaffey Fabric Structures was contacted by Peter Holmes, a contractor awaiting construction on a fire station in upstate New York. The firehouse was victim to an accidental fire, and needed a temporary shelter to house its equipment and trucks. The structure needed to be built quickly, but a rushed timeline is no stranger to Mahaffey’s expert crews. The parking lot in which the structure was to be built had a drastic elevation difference, and the structure was installed on a slope. Because this project took place in the freezing winter months of upstate New York, the potential of snow was an issue. Mahaffey’s workers also experienced several electrical issues throughout the project. Under the lead of Mahaffey project manager Mark Huels, the crews built a 50’ x 82’ semi-permanent structure to accommodate the fire department’s needs. To combat the obstacle the slope introduced, Mahaffey installed 13’ legs on the high side, and 16’ legs on the low side. These different size uprights adequately accommodated for the three-foot drop in elevation. The uprights enabled the structure to look level. Additional purlins were added to the structure to ensure the structure would remain stable throughout any potentially damaging weather conditions. The purlins were complemented by internal gable uprights. To ensure the pipes of the fire trucks didn’t freeze, Mahaffey was innovative with insulating the entire structure. Insulated hard sides kept the heat in, and were sealed all the way up with no exposed fabric. The internal roof panel was fully padded with insulation, with a top layer of gable fabric. Large, electrical personnel doors were customized to adapt to the slope on which the structure was built. Mahaffey crews added extensions to the doors to fit the elevation. The structure housed Mahaffey’s ExpoDeck plastic flooring and lighting throughout. The fire station was up and running in a matter of weeks, and the fire station was fully functional within a month. 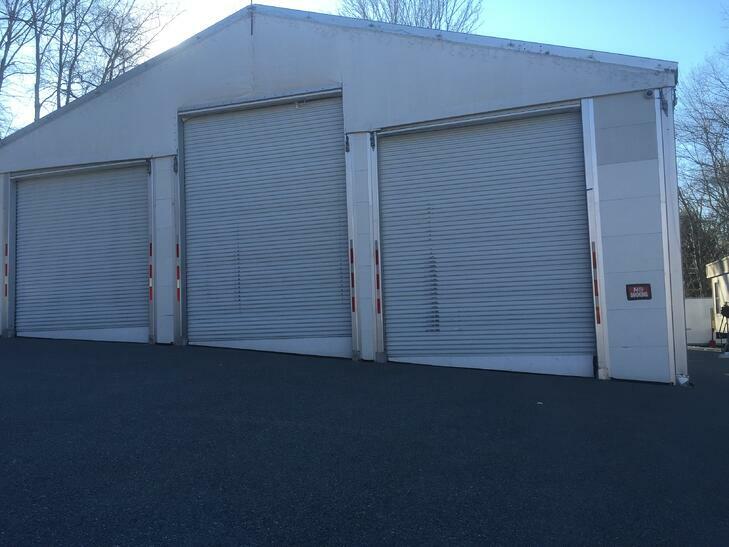 The large electrical doors allowed for a quick exit for firetrucks, enabling the firefighters to quickly respond. The structure has proven to be successful, as it is still functional today. The fire department had every intention to have a new station built the beginning of this past year, but due to permitting challenges, were unable to. Thankfully, this semi-permanent structure was built to ensure the safety of the Goldens Bridge area. Interested in learning more about temporary warehouses and work areas, or want more information about the services we offer?